Atlantic hurricane season begins June 1, but we will likely have a near-normal or below-average season this year, NOAA announced Thursday. The NOAA said in its outlook released at a news conference in New York Thursday that scientists are predicting three to six of those storms could become hurricanes -- storms with winds of 74 mph or higher -- with one or two at a Category 3 or higher, with winds of at least 111 mph. The seasonal average for the Atlantic region, which includes the North Atlantic Ocean, Caribbean Sea and Gulf of Mexico, is 12 named storms, six hurricanes and three major hurricanes, the NOAA said. Major hurricanes are considered to be Category 3 or stronger on the Saffir-Simpson Hurricane Wind Scale. A slower-than-average hurricane season forecast this year is due to a developing El Niño weather pattern. El Niño refers to a periodic warming of the Pacific waters off the west coast of South America near the equator. It often begins around Christmastime, so local fisherman called it El Niño, for the Christ child. This above-average warming of the eastern Pacific causes the upper-level jet stream wind pattern to strengthen and shift farther south, placing it over the prime hurricane development zone in the Atlantic. The stronger winds aloft can shear off the tops of tropical thunderstorms in the western Atlantic -- which decreases the development, number, and intensity of hurricanes. However, strong hurricanes can occasionally still develop during an El Niño pattern. Hurricane Andrew was a powerful storm that devastated south Florida during the El Niño year of 1992. It's still uncertain as to how much of a role El Niño plays in suppressing hurricane development. 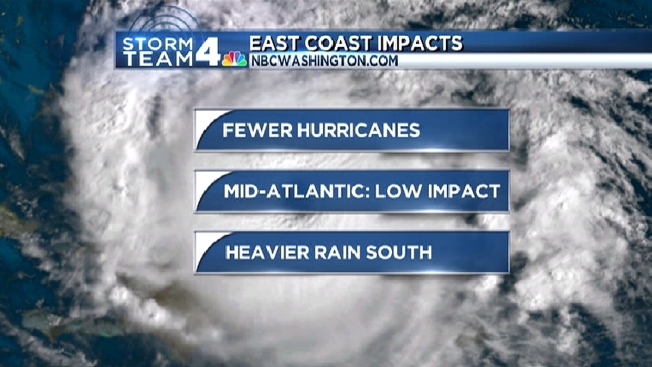 A season can bring many storms with few landfalls and a minor impact, or just one or two hurricanes that can hit the east coast with a major impact. It's important to pay close attention to our weather forecasts during hurricane season. As always, Storm Team4 will keep you fully informed.